Rollaway beds are convenient and useful. This is because they only serve their purpose when they are required to, then they are kept away. The best advantage of using these kinds of beds is that they do not occupy a great deal of space. When you have guests in your home, but not enough space to accommodate them, the rollaway bed becomes an excellent compromise. If this is something that you know you must have, you need to go for the best rollaway bed to enjoy the convenience and the benefits it comes with. This simple rollaway bed is easy to use and to put away, as it can be neatly folded. It comes with a 4-inch mattress that has a premium cover to ensure comfort. There is also an inch top layer of fiber padding and 3 inches of pressure relieving comfort foam to give you maximum support. Additional features include a deluxe steel frame with casters that will make it easy to transport to where you want to use it. The casters are positioned nicely on the frame so as to ensure that its legs are not moving on the floor once you open the bed. With it you get a storage bag as a bonus to keep it safe and clean until the next time you will need it. It is a perfect sleep solution for hotels, bed and breakfast inns, house guests, for campers, travelers, for sleepovers and dorm rooms. It folds very easily and neatly to ensure that it is not taking much of your space. The frame is light in weight but very sturdy. You get the best quality mattress that will last you for a long time. The bed is durable and strong. It comes with everything you need for a comfortable night, that is a mattress, a bed frame, a mattress cover and a cover. The cover can be removed easily for cleaning purposes. 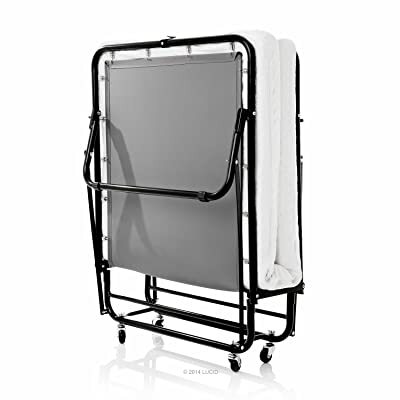 It only folds in half almost upside down; therefore for users with mobility issues, you might have a hard time trying to fold the mattress, though it is light in weight. This is one of the most luxurious folding beds you will get in the market today. It is perfect for a guest house and it is designed to offer comfort, style as well as durability. 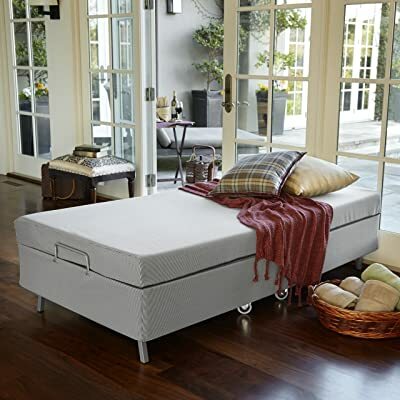 It comes with a 5-inch mattress that has an inch of memory foam and 4 inches of high density base support foam, which will give your guests the comfort they need in order to enjoy a great night away from their home. The mattress is made of the latest evolution memory, which includes natural green tea extract and all natural active charcoal which will keep moisture away from your mattress, eliminate odors and keep it fresh for as long as it will be in storage. A strap and a hook are included in order to keep the bed securely closed when it is not in use. Its frame is made of very solid steel and is easy to fold to keep the bed away with ease after its use. The fabric on the mattress matches the frame to make it a perfect set. When the bed opens, it becomes a twin size measuring 38 by 75 by 19 inches, for both the mattress and the frame. It is very easy to put together after use, with no need for tools. Its sturdy construction will give you the best service for a long time. It is very easy to manage for the length of time you will be using it. It is a great quality roll away bed. It is light in weight and very easy to move. It is more of a cot than a bed. This is a great choice for people who do not have much space in their houses but they need an extra bed from time to time. The bed is super comfortable, just what you need for your visitors when they want to spend the night at your house. It has everything you will need to make yourself or your guests comfortable. You just need to unfold it and it is ready to use. This folding bed has one of a kind fit and finish. 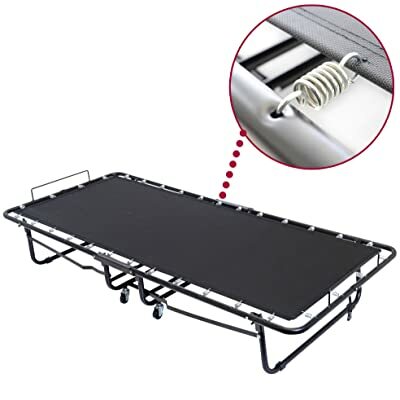 It has a full metal bed frame with assisted folding, double-reinforced stabilizer bars. It comes with a foam mattress with an extra-soft cover that is removable for washing purposes. Its bed base feels supple but it is very supportive. It is very easy to assemble and put away, with no tools involved. It is a very strong bed, that can support adults as well. It is made of the best quality in order to last the user for a long time. It is all inclusive; you will just need a pillow and a blanket and you are good to sleep. Its legs are stabilized and double-reinforced to ensure that you are not falling of the bed in the middle of the night. It is very easy to move and store too, therefore do not worry about limited space in your home. Its trampoline base style may not work for a lot of people especially if the mattress sags in the middle lengthwise. This is a super comfortable foldaway bed that will give your guests the hospitality and the comfort that they need in your home. It is a cot size bed that measures 31 by 74 by 4 inches. It is very easy to store away as it folds very easily. It comes with a rollaway mattress that is soft and very supportive. The mattress is of medium plush, featuring an inch of memory foam and 3 inches of support foam. You will assemble it very fast and easily and then lock its two wheels for support and safety, then it will be good to use. Its bed frame is of heavy duty and it comes with an impressive warranty of up to 25 years. It has a rayon from bamboo over that is the best for anyone with a sensitive skin, which also works to regulate sleeping temperature to ensure that your guests are comfortable throughout the night. It has a very durable construction that gives the bed its strength and sturdiness. Its powder coated steel is unique, lightweight and made of a great design. Its structure has been designed for strength for maximum support and durability. It is very easy and quick assemble, make it simple to put away after use. Its steel is light in weight for easy transportation, though it is durable and highly supportive. It is easy to store even in areas with limited space. It comes with a nice, firm and very comfortable mattress. It is not large enough to accommodate more than one adult. When it comes to rollaway beds, you have to pick one that requires minimal assembly, which is exactly what you get with the layout folding bed. It comes with everything you will need in order to secure its base and attach its wheels to prepare it for use. It features a bed frame that is 100% metal, reinforced stabilizer bars, firm poly deck mattress base and a deluxe memory foam mattress that has an extra soft cover that is removable for washing reasons. You will love it as it has a unique and great finish which makes it sleek looking. This is one of the most comfortable and compact folding sleeper you can buy for your home, guest house, dorm room and anywhere else you feel you need a rollaway bed. It is very easy to fold for storage. It is easy to open and assemble too. It is easy to maintain, with a removable cover that can be cleaned with ease. It is highly durable as it is made of all-metal tubing. It is very comfortable as its deck mattress base is attached to its frame using 32 metal springs, which gives it a firm foundation. It is portable and easy to move about. Folds in half, therefore may give you a hard time folding and keeping its mattress in place. A rollaway bed is just like every other normal bed only that it can be folded and kept away if it is not in use. You can relax and sleep on it, just like on a normal bed. However, rollaway beds are very useful in cases where one does not have much space for a normal bed but you will need an extra bed from time to time. Basically, foldaway beds should occupy the least amount of space for easier storage; therefore you need to consider how thick the bed will be after being folded away. Will it comfortably fit in the space you have set aside? You can store yours under a cot or even inside your closet or wardrobe; therefore choose one that will fit with ease. This mainly depends on your needs because rollaway beds are usually available in different sizes, which are full, queen and twin sizes. If you have guest coming to your home in bunches from time to time, you will benefit so much form a full size rollaway bed. Such beds can be folded down whenever they are not in use and stored away, only to be brought put when visitors are ready to rest. There are those that are affordable and most of them can offer full comfort, therefore they are a perfect choice to go for. Basically, you go for a size of bed you are sure will fit the number of people you will be providing sleeping arrangement for. You choose a rollaway bed depending on the kind of support and stability you need on your bed. There are those beds with wire mesh mattresses support and there are those with wooden slats frame. The latter is the preference of many because it is said to be more comfortable and it does not squeak or sag. Always go for a solid frame because this is what determines the strength of the bed, then it will be able to hold enough weight. In as much as rollaway beds should be strong, they need to be highly mobile so that you can move yours to a perfect location with ease whenever you want to use it. Some of them have wheels, therefore moving them from one room to the other or from one location to the other will not be a major issue. If you buy one without wheels, ensure that it is light enough to be carried from one place to the other. Therefore, when shopping for one, ensure that you know how much the frame weighs, together with the mattress so that you will know if you will have an easier time using it or not. Rollaway beds, also called guest beds or folding beds are great to have in any home especially if you do not have much space yet you want to accommodate guests comfortably in your home for a sleepover. There are different types of such beds and their difference is mainly in their construction and their manufacturer. This is an ordinary looking rollaway bed that you will find in most hotel rooms. It is standard as it does not have so many extras. Most of these types of rollaway beds have a heavy duty frame with wheels in the place of casters. Some can be a real heavyweight, and strong enough to carry a heavy weight. When not in use, it can be folded easily, to ensure that it can fit in the least amount of space. Most of the standard rollaway beds are attached to the headboard and all its other features can be adjusted depending on the elevation of the head. All in all, they are very useful and durable. 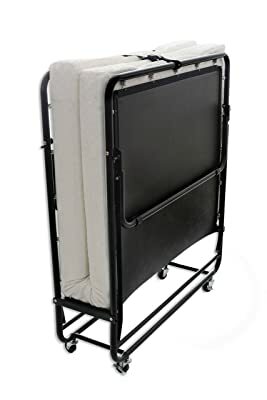 This type of rollaway bed contains a metal frame and it is very similar to the standard type only that it folds about a third way, not like the standard one. The ottoman bed has a slipcover too, and it can fold out into a box. It is however more of a cot than a bed; therefore it can only be used by a small number of people as compared to a large twin bed. 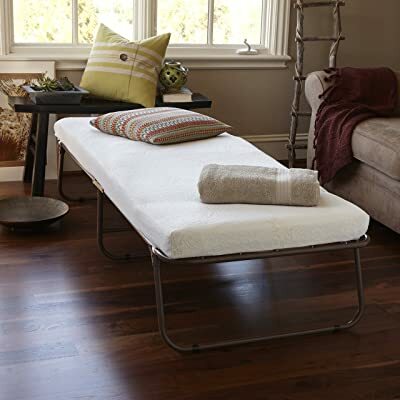 This is one of the most popular fold away beds you will get in the market today. It can be customized to different styles and finishes to suit the user’s needs. You can for instance extend it to ensure that it is offering the right kind of support you need to serve you well even under stress. The cabinet rollaway bed is basically in the form of a futon mattress, most of them measuring 6 by 8 inches, with the mattresses supported mainly by wooden slats. Some have cabinets included, sitting on the castors. It has to be turned around for you to gain access to the bed. This one is common too. It is metallic and can be folded down to half the total area of the bed. It is cheaper and its main advantage is the fact that it looks just like a normal bed. It can hold just a single person though; therefore this is not the best choice if you are expecting to host more than one guest. There are a lot of benefits and shortcomings that come with a rollaway bed and each type of rollaway bed has its own advantages and disadvantages. A rollaway bed will always help you take care of your unexpected guests. You do not have to buy a normal bed if you will not be using it every other day as it may occupy useful space in your home. Just have a bed that will be rolled out when it is needed and folded away when it is not needed. Preparing a rollaway bed for your visitors will take just a few minutes, with no skills or tools needed. After use, folding it away is equally easy. Most of the beds have everything you will need lest for a blanket and pillows, saving you bed preparation time. Rollaway beds are very affordable; therefore if you do not have so much money, you do not need a regular bed especially if it will not be used daily. You can save so much money by buying a fold away bed. The bed can be used in so many other ways if there are no guests sleeping over. Rollaway beds are highly portable, therefore you can carry yours from one place to the other in order to have a comfortable place to sleep in when you are out there. When you go camping for instance, you do not have to sleep on the floor when you have such a comfortable bed. They come in all sizes, for children as well as adults; thus it is easy to get a perfect size at purchase. Some of these guest beds can be very difficult to assemble and fold away, giving you a hard time when preparing a place for your guests to sleep. That is why it is important to check how easy it is to use one whenever you are shopping. 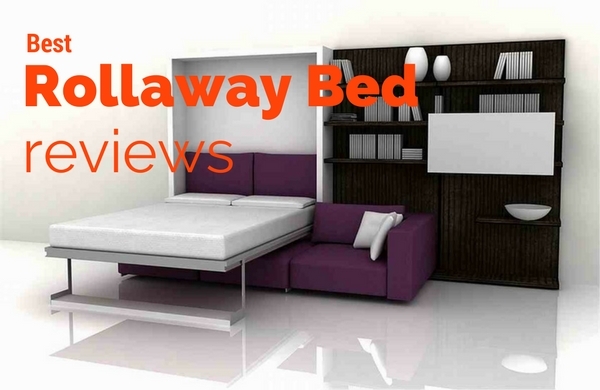 Rollaway beds have been used in the world for a very long time and users have been providing reviews about the different brands they are using in order to make it easy for buyers to make a wise decision. 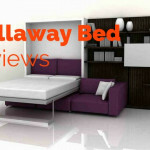 Millard: this is one of the best brads to go for whenever you are choosing a rollaway bed. Rollaway beds by Millard are usually very strong, with a very strong frame, enabling you to accommodate any type of guest for a sleepover. Millard can be said to produce strong and highly durable guest beds that can accommodate the maximum weight of two people, therefore you will be happy to host your friends or family when they come over for a visit if you choose one of them. LUCID: this is another amazing company to choose from whenever you start shopping for rollaway beds. LUCID beds are easy to fold away and roll out, and they are very easy to store away after every use. They also come with a good quality, soft, mattress so as to provide everything your guests will need to spend a memorable night in your house. Sleep Master: this is a company which guarantees rollaway beds that are super comfortable and thus very useful for your home needs. Anyone that will be visiting you will be able to enjoy the comfort. iBed: the company may be new but it is slowly gaining popularity in the domestic market for its great quality products. Theirs are rollway beds that are easy to store away, with great and strong support and very comfortable, a place you will love your guests to sleep in. Their beds are easy to assemble too. Due to their advantage, rollaway beds are a must have in any home. They are convenient, easy to handle and very comfortable, therefore you will not have to worry about hosting guests in your home if you do not have enough beds. Buying a rollaway bed is tricky though, but this is a complete guide that will help you make the right buying choice today.